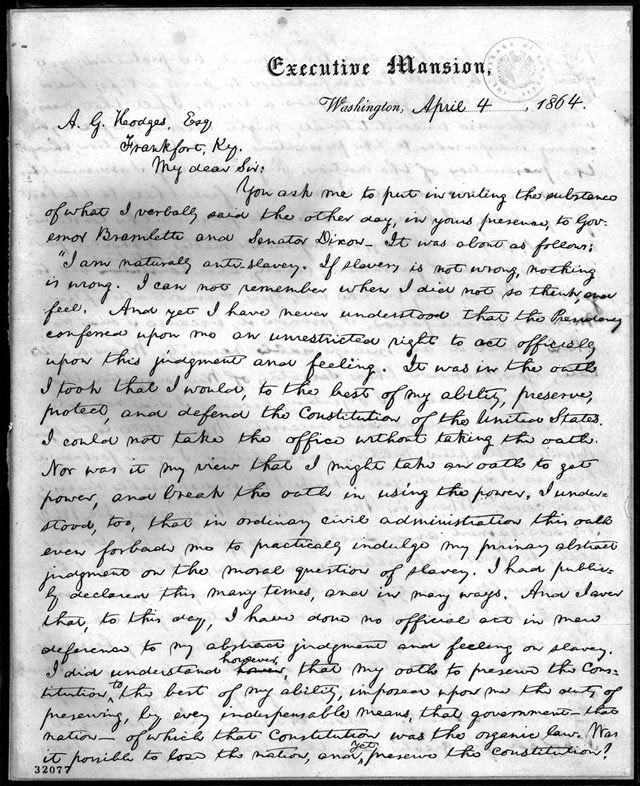 April 4, 1864. “On March 26, 1864, former Senator Archibald Dixon, Governor Thomas E. Bramlette, and Albert G. Hodges, editor of the Frankfort, Kentucky, Commonwealth, journeyed from Kentucky to Washington to meet with Lincoln and discuss the recruitment of slaves as soldiers in Kentucky. There was considerable dissatisfaction in the Blue Grass state on the issue because, although the Emancipation Proclamation did not apply in the border states, runaway slaves could gain their freedom through military service. “Lincoln heard their complaints but went on to persuasively outline the benefits of allowing blacks to serve in the Federal Army. . . .
taking the oath. . . . I understood, too, that in ordinary civil administration this oath even forbade me to practically indulge my primary abstract judgment on the moral question of slavery. I had publicly declared this many times and in many ways. And I aver that, to this day, I have done no official act in mere deference to my abstract feeling and judgment on slavery. I did understand, however, that my oath to preserve the Constitution to the best of my ability imposed upon me the duty of preserving, by every indispensable means, that government — that nation — of which that Constitution was the organic law. Was it possible to lose the nation and yet preserve the Constitution? . . . I felt that measures, otherwise unconstitutional, might become lawful by becoming indispensable to the preservation of the Constitution through the preservation of the nation. Right or wrong, I assumed this ground; and now avow it. I could not feel that, to the best of my ability, I had even tried to preserve the Constitution, if, to save slavery or any minor matter, I should permit the wreck of government, country, and Constitution, all together. When, early in the war, General Fremont attempted military emancipation, I forbade it, because I did not then think it an indispensable necessity. When, a little later, General Cameron, then Secretary of War, suggested the arming of the blacks, I objected, because I did not think it an indispensable necessity. When, still later, General Hunter attempted military emancipation, I again forbade it, because I did not yet think the indispensable necessity had come. 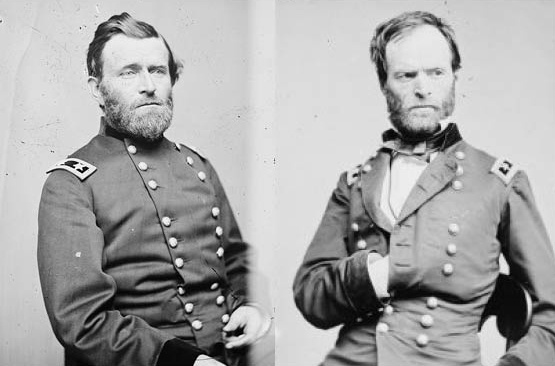 When, in March and May and July, 1862, I made earnest and successive appeals to the border States to favour compensated emancipation, I believed the indispensable necessity for military emancipation and arming the blacks would come, unless averted by that measure. They declined the proposition, and I was, in my best judgment, driven to the alternative of either surrendering the Union, and with it the Constitution, or laying strong hand upon the coloured element. I chose the latter. In choosing it, I hoped for greater gain than loss; but of this I was not entirely confident. More than a year of trial now shows no loss by it in our foreign relations, none in our home popular sentiment, none in our white military force,-no loss by it anyhow or anywhere. On the contrary, it shows a gain of quite one hundred and thirty thousand soldiers, seamen, and labourers. These are palpable facts, about which, as facts, there can be no cavilling. . . .
[Lincoln concludes with a passage that is akin to part of his Second Inaugural, which he would give a year later.] . . . I claim not to have controlled events, but confess plainly that events have controlled me. Now, at the end of three years’ struggle, the nation’s condition is not what either party, or any man, devised or expected. God alone can claim it. Whither it is tending seems plain. If God now wills the removal of a great wrong, and wills also that we of the North, as well as you of the South, shall pay fairly for our complicity in that wrong, impartial history will find therein new cause to attest and revere the justice and goodness of God. Margaret E. Wagner, The Library of Congress Illustrated Timeline of the Civil War, pp. 171-172.